Who has not witnessed the dramatic uptick in societal chaos and regional disruption throughout the USA since the “Great American Eclipse”? What follows are just a few of the manmade-natural events which were carried out against the American people by those who have sought to destroy the Republic. This unparalleled period of karmic blowback began with the total solar eclipse that passed directly over the United States on August 21st. Very few people realize just how deeply transformative this celestial event has been for the nation and its citizens. 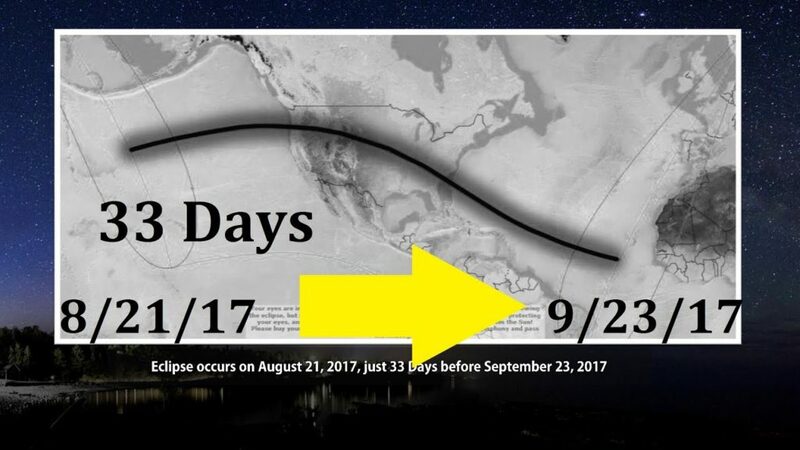 Fewer understand the greater context associated with the 33-day cosmic window that was opened during that uniquely American eclipse. The more folks who truly apprehend the enormity and profundity of this highly consequential interval, the more likely that a successful outcome will result. Just why is that? Let’s be clear: the entire planetary civilization has experienced a significant increase in unpredictable and unsettling events since the U.S. presidential election of 2016. All of this unprecedented pandemonium has been orchestrated by purposeful design. Those who have controlled the destiny of humankind for centuries are at a crossroads and must implement their misguided agenda now or forever be denied its fulfillment. The power elite are especially aware that their flawed version of technological singularity has reached a critical milestone. It’s for this and other reasons that the aforementioned 33-day window of opportunity to sow seeds of chaos has been taken advantage of. TPTB know full well that this is the last chance to execute the key parts of their New World Order agenda leading to the establishment of a One World Government. It’s crucial to understand that nothing causes more chaos, more quickly, than Illuminati-directed acts of weather warfare. This has just been experienced in two of the largest states in the union—Texas and Florida. Both states have been deeply affected by HARVEY and IRMA, respectively, and will take years to recover from some of the worst damage. The bottom line regarding the increasingly weaponized weather and transparent environmental terrorism is Ordo Ab Chao. In the aftermath of so much manmade disaster and natural catastrophe, the cabal is able to quite easily impose a new order on a city, a state, or a nation marked by excessive control. The residents in Key West are victims of this FEMA command and control structure at this very moment. This is exactly what TPTB have always done in the advancement of a One World Government via disaster capitalism. Clearly, weather warfare and climate engineering will continue to be their primary MO by which they continue to lock down planet Earth. In light of how much time and energy the geoengineers have spent fastidiously fabricating this frankenstorm, it’s unlikely (though still possible) that they will just let it peter out in the Atlantic Ocean. 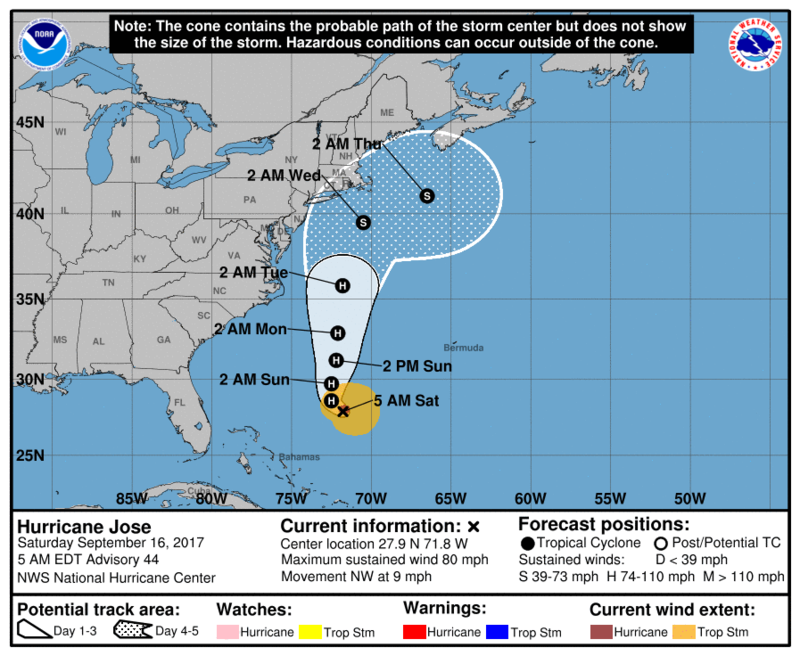 At this pivotal stage of the 33-day window that closes next Saturday, it’s difficult to imagine that the cabal will permit Hurricane Jose to come to nothing. If the future bears out the worst case scenario for JOSE, it will most likely be steered similarly to Superstorm Sandy. In this way the shadow government will use it as a catalyst which will precipitate a whole cascade of Ordo Ab Chao events just like 9/11 did. Were JOSE to hit the greater New York City metropolitan area, it would likely trigger and epidemic of 9/11-type PTSD symptoms, especially coming so close to the 9/11/17 anniversary. The wise would be well-served to keep their eye on JOSE, and be ready to respond at a moment’s notice. Don’t get blindsided like the good folks did in East Texas by HARVEY. This rapidly developing situation regarding JOSE brings up the following important point. Where else does one see the NWO cabal perpetrate unprovoked acts of aggression which lead to widespread death and destruction like that seen in the wake of a 1000 year flood or mega-hurricane? In other words TPTB can get away with destroying a city or wrecking a coastline using weather weaponry by blaming it on Mother Nature. How else can the power elite attack the entire state of Florida, and get away scot-free?! This final week leading up to Saturday, September 23rd promises to be as society-busting as any since 9/11/01. The resulting paradigm-shift will surely open up new doorways of perception for the whole human race. This is fundamentally a VERY good thing. Whenever men of science and technology harness the forces of Mother Earth and aim them at defenseless targets around the globe, an awakening happens. Not only are many people humbled by such a show of raw and overwhelming force, others are awakened to the truth of the weather warfare occurring everywhere—24/7. These unending weather assaults, then, are serving as much-needed wake-up calls. Eventually everyone will be “shock & awed” with one weather calamity after another, or by a wildfire conflagration, or a devastating earthquake, all of which can be manmade and often are. In this manner, a critical mass of souls will become aware that weaponized geoengineering and weather warfare constitute the single greatest threats to humanity, and there are many other perils out there. These revelations represent the primary realizations that are spreading like wildfire throughout America and the world-at-large as we approach 9/23/17. As each hurricane blows through a different region, the consciousness is refreshed by the cleansing rains and winds to make way for these truths. Wherever an earthquake or mudslide or sinkhole should strike without warning, those affected are shocked into a new way of understanding what really causes such earth movements. In this fashion, September 23rd is functioning as a rebirth for the present tract of humanity. September 23, 2017: Jupiter, Virgo and the Coming Rebirth However, what is essential to correctly comprehend is that no birth, or rebirth, is without its birth pangs. Therefore, September 23rd ought to be perceived as the junction point for a cosmic rite of passage. Such rites always come with various challenges and obstacles, trials and tribulations. 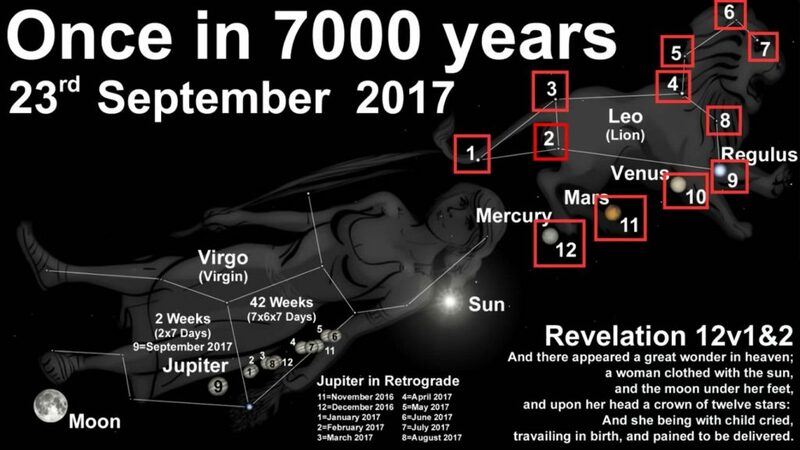 In this particular context, the Fall of 2017 marks the beginning of a 7-year period that is defined by September 23rd. Whether this specific date is the line of demarcation for the start of the Great Tribulation remains to be seen. Regardless of what does or does not transpire after the 23rd, there is a palpable desperation seen and heard and felt as never before. Those who have forever held the reins of global governance seem to have lost their hold, as well as their minds. The major events that are now taking place across the planet with increasing intensity reflect this unmistakable air of desperation and insanity. Because those who operate at the very peak of the pinnacle of the planetary power pyramid are in competition with each other for the very first time, things have gotten really crazy out there. For instance, these crazymakers want to normalize and legalize everything that they have indulged in over millennia. The systematic legalization of recreational drugs and pedophilia are just two examples of their handiwork. What else could result but the Great Tribulation from such an irrational state of affairs both locally and globally? When the top leaders of the world are incorrigible, criminally insane psychopaths, nations and societies everywhere will suffer terribly. The more unaware the common people are of this worsening predicament, the more difficult their “Tribulation” will be. That’s why it’s imperative to share information about the weather warfare being waged against nations large and small. The constant geoengineering of the realm has put the biosphere in great jeopardy. Some climate trends have been irreversibly altered; likewise, weather patterns everywhere are being irreparably disrupted. This can only lead to global chaos which the elites will use to justify a tyrannical One World Government. Basically, whoever controls the weather controls the whole place. In light of this pervasive plight, every inhabitant of this planet is highly encouraged to invoke the Highest Power for urgent assistance. For it is only through divine intervention that an enduring resolution will manifest. We are now just seconds to midnight and but moments away from an ELE that can come from any direction. There is perhaps nothing more dangerous to mankind than the escalation of the weather wars. Hence, there must be an immediate airing of those dangers and risks to the civilization. In the current tense environment everyone has become a stakeholder. Everyone wants their say about adverse weather manipulation as it can affect every aspect of life. Since no one wants to be left out of the public discourse, the best way to influence it is to pray for divine intercession—post-haste before JOSE shows up in someone’s back yard.